This is a cat tooth. Normally, one would find it inside a cat’s mouth. Obviously, this means the beasts have graduated from the level of “cat fight” to “hockey fight”. I’ll have to buy them little jerseys they can pull over each other’s head. I hunted them each down in turn to play the “show me your mouth” game so I could figure out who’s won a vet visit. Mojo was first, and he’s easy – after months of pills and medicines and vet visits, he surrenders after only the most perfunctory of struggles and lets me check his mouth. He was fine, so Horton was next. Also a simple task, since he very much enjoys baring his teeth to bite my face off. I pissed him off, let him pounce, and quickly counted fangs before he made contact. So, that leaves this furry Animal. He hasn’t been acting differently at all, so I’m incredibly surprised to find him shedding teeth. How long has he been in pain? How bad are the other teeth? It doesn’t look like it broke off in a fight, because the edges are too jagged. 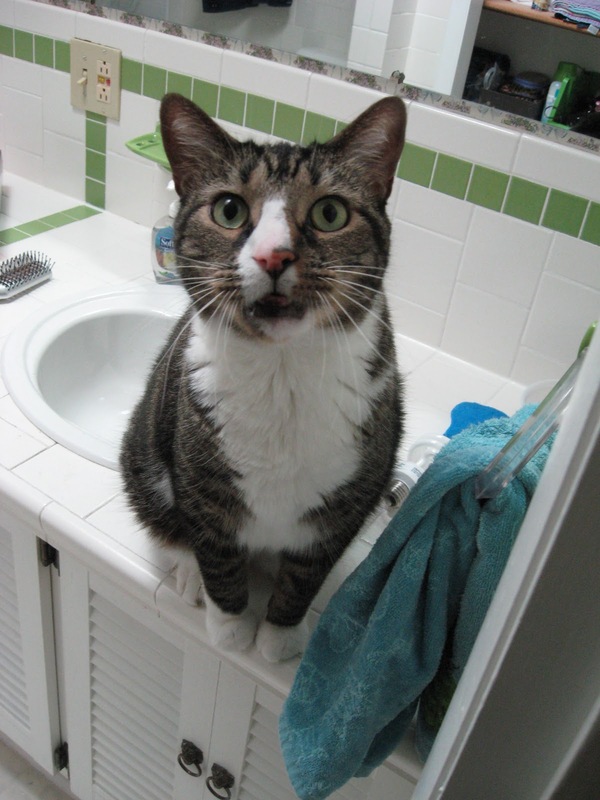 I suspect that he inherited the same bad-teeth genes as his older half-brother, and will need some kitty dental surgery. I’m feeling so guilty about not bringing them to the vet more often, but they’re healthy and happy and there was really no need, or so we thought. They’re getting older, and we only recently realized that – Mojo is 12 and Animal is 11, which means they’re considered “seniors” in the cat world. Like older people, I guess the health problems start to stack up as kitties age. We’ll be doing regular visits to the vet now, for all of them, so we can hope to catch problems earlier and not have to resort to anything drastic. This entry was posted in Uncategorized on June 16, 2012 by antijen.